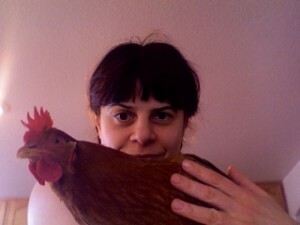 I am an urban homesteader in Colorado Springs, CO. I raise chickens, make my own yogurt and am learning to grow some food, all within sight of downtown in a 1950s era neighborhood.I got here because life happens as it happens and I was widowed at age 39. This led me to believe there is no time like the present to live the life I want to live, and what I want is a life in my own version of the Wild West, with chickens. I would like you to believe I am an imposing pioneer woman with a gray braid, long cotton dress and a shotgun handy in case anyone tries to evict my hens from the city (“Get off my land, Sheriff. The chickens are staying and they’re not paying their taxes either!”), but chickens are perfectly legal in Colorado Springs and none of that is actually true.